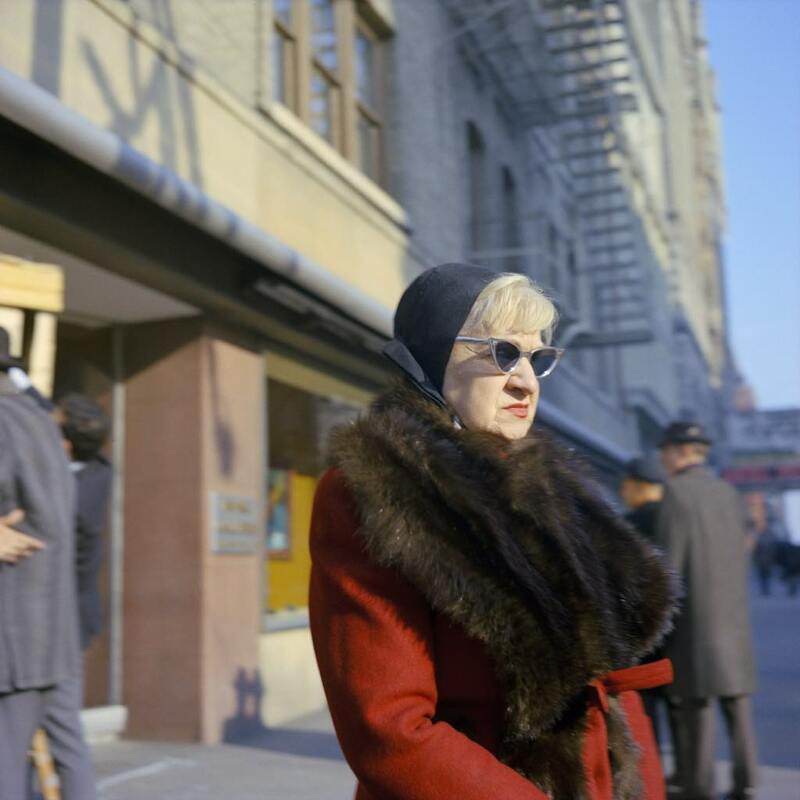 For such a private person, Vivian Maier took an awful lot of self-portraits. 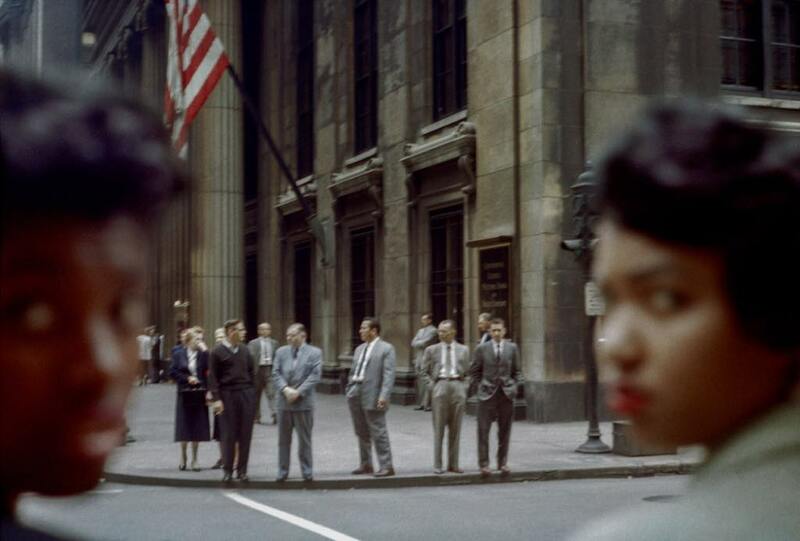 That was one of the impressions I got from the current show of color and black-and-white images by the enigmatic street photographer/nanny now on at Les Douches la Galerie. But then again, since she hardly ever showed the some 150,000 photos she took in her lifetime to anyone, those proto-selfies remained a secret, at least until her work was discovered and eventually made public after her death. The mysterious Maier, who was something of a hoarder and died at the age of 84 in 2009, took photos constantly but never even printed many of them. She never threw them out, though. In 2007, her photos – which have been compared to those of all the great street photographers, from Robert Frank to Diane Arbus – came to light when boxes and boxes of negatives keep in a storage locker were auctioned off because the rent had not been paid. Born in the United States in 1926, Meyer had a French mother and spent much of her youth in France, where she first began to take photos with a Kodak Brownie. She bought herself a Rolleiflex in 1952. Other cameras would eventually follow, including a Leica and other German cameras. In the 1980s and ’90s, she switched from black-and-white film to color transparencies. An eccentric loner, Maier had no family or close friends, but she did have relationships with the children she cared for and traveled around the world on her own. As she grew older, her existence became more precarious, and although she received help at that time from some of her former charges, there were periods of homelessness in her old age. She died in a nursing home in Chicago in 2009. Like all of the extant prints of Maier’s work, those in this show were printed posthumously, with clues as to her artistic preferences gleaned from the many documents she left behind, including her instructions to photo labs and the prints she had made herself. 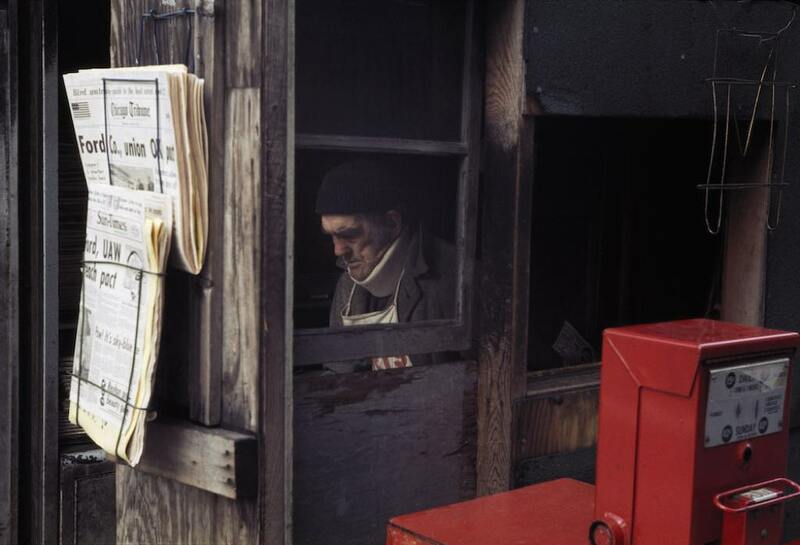 John Maloof, one of three Chicago collectors who bought some of the negatives at auction and recognized their worth, brought Maier’s work to the public’s attention in 2014 with his documentary Finding Vivian Maier. 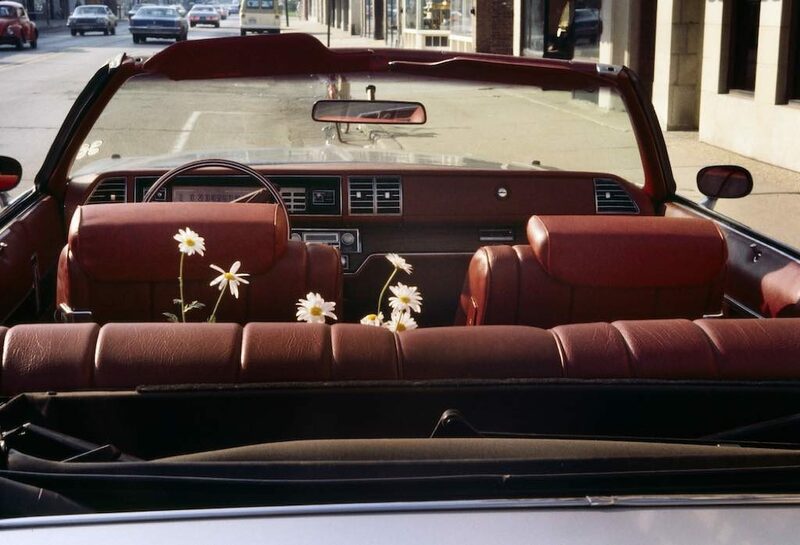 In the color prints that are the focus of this wildly popular Paris show, the acuity of her eye is clear: daisies seem to grow out of the backseat of a convertible with a red interior, old ladies dressed in showy colors and garments pose in the street so the world (and Maier’s camera) can drink it all in – although she herself was rather mousy and dressed simply in a long skirt, jacket and floppy hat, Maier seems to be attracted to the finery of other women. A number of images zoom in on feet, which tell their own story: in one image, we see a woman’s stockinged right leg in a red pump, her left leg in a knee-high cast with a green heel and, to the left of that, a man’s leg in gray trousers with a rundown-at-the-heel black shoe. 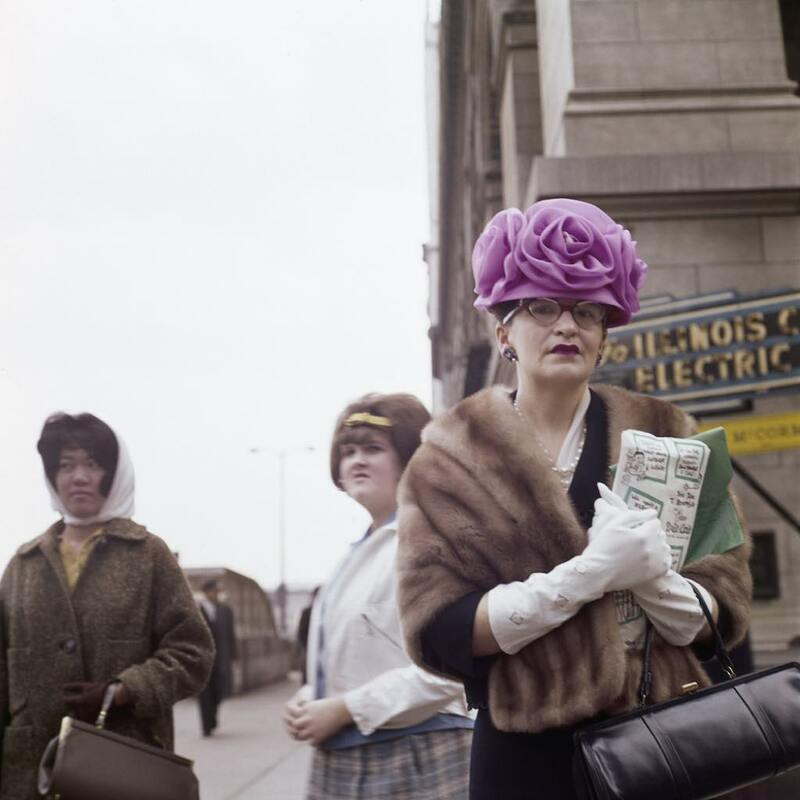 Maier, whom photographer Joel Meyerowitz has called a “poet of color photography,” had a sharp eye for patterns and contrasts, as in a picture of a stout lady, seen from behind (as are many of her subjects), wearing a multicolored print dress and white pumps and standing next to a waist-high stack of newspapers repeating the same headline – “accused in burglary” – over and over. Could it be that Maier, who does not seem to have had much of a personal life of her own, found her friends and family in those she photographed (and sometimes recorded and filmed) in the street? If so, hers was a virtual society of another kind into which she inserted herself in the “self-portraits,” very often as just a ghostly shadow or reflection. Thanks to Maloof’s research, we now know more about this snap-happy nanny – that she was a feminist with left-leaning political views, for example – but the air of mystery remains. One wonders what would have happened if she had come of age in the digital era. Would her many artistic selfies have popped up on Instagram? I suspect not. The eyes of the woman on the right, in particular, in the last pic of the article, captures well-groomed and deserved rage and suspicion. I first became acquainted with her work a year or so ago at Isle sur la Sorgue, where some of her photos were being shown at a museum there. Loved them. To think she never showed them during her lifetime is astonishing.